If your goal is to make this year’s New Year’s Eve celebration unlike any other you’ve ever experienced, Niagara Falls is the perfect place to do it. For out-of-towners who have never visited Niagara Falls before, seeing this gorgeous natural sight is a memory you’ll never forget. Locals often enjoy staying in Niagara Falls because it features world-class entertainment amid gorgeous scenery. Visitors return to Niagara Falls again and again because there’s an allure to the city that makes it a warm and welcoming global destination. Pair the breathtaking attraction of Niagara Falls with a celebration to ring in 2018, and you’ve got an amazing way to welcome in the New Year. There are so many diverse choices for all tastes, and many restaurants provide beautiful views of Niagara Falls to enjoy as you dine. The whole family has delicious options, with lots of places that are kid-friendly, in addition to romantic dining options for couples. Most Niagara Falls hotels also have luxurious dining offerings, so you’re only a few steps away from a delicious Niagara Falls New Year’s Eve 2017 meal. When you book Niagara Falls NYE 2017 packages, some hotels offer luxurious Prix Fixe meals in your package or vouchers to spend as you wish. One of the most beloved Niagara Falls New Years events is the annual Niagara Falls New Year’s Eve concert in Queen Victoria Park. From 8 p.m. to 12:30 a.m., some of Canada’s most well-known and awarded artists take the stage to entertain more than 40,000 attendees at the free event, with the concert area opening at 6 p.m. In 2017, global sensations Simple Plan take the stage, along with Canadian stars Jess Moskaluke and bands Marianas Trench and James Barker Band. The diverse roster includes musical styles ranging from pop punk to country, giving everyone a little something to enjoy. In addition to the main stage, there are several video screens that will broadcast the performances to people in the park, so all attendees can see the show from wherever they are. The Queen Victoria Park Niagara Falls New Year’s Eve bash also includes several food and drink options, plus lighting art and fireworks. Visitors can grab a bite at a nearby restaurant and visit the Table Rock Welcome Centre for shopping before or during the concert. If dancing the night away sounds like your idea of a great time on New Year’s Eve, then Niagara Falls has tons of options for partygoers. Niagara Falls NYE 2017 has dozens of nightclub extravaganzas, as well as club crawls, brewery events, singles parties, theme parties, masquerade balls, Latin dance nights, and so much more. Nightlife events are held at a variety of locations throughout the Niagara Falls area, including hotels and resorts, bars, nightclubs, and event venues. Whether you love a good theme and enjoy dressing up in costume, or you want to get all dolled up in your finest attire and take over the dance floor, there are so many nightlife options in Niagara Falls that heat up New Year’s Eve. Niagara Falls is a top destination for groups looking to have fun, like bachelor and bachelorette parties, and it’s also a place where couples visit when they want to spend quality time together at exciting nighttime events. You might be surprised that the Niagara Peninsula enjoys a milder climate than many other places that are as far north. This means you’re not likely to have to face an ice storm, blizzard, freezing rain, or even a chilling wind, so you can still dress as fashionably as you want and be comfortable. The temperature will probably sit somewhere between 30 degrees and 45 degrees, so while you’ll probably want to wear layers to stay warm while you’re outside, you can still wear eye-catching party clothes that fit wherever you’re going. For those who are looking to escape freezing temperatures, and for those who want to experience the New Year’s Eve holiday in a wintry wonderland, Niagara Falls strikes the perfect balance. Outdoor activities are freshly invigorating, and curling up with your beloved in your hotel room is sublimely cozy. Niagara Falls is absolutely beautiful at night throughout the holiday season thanks to the Winter Festival of Lights, which runs through the end of January. Roughly three miles of Niagara Falls — including the tourist district and the Dufferin Islands — become home to millions of twinkling lights and scores of stunning, lighted displays. Niagara Falls itself is lit up all New Year’s Eve, so whether you’re at the Queen Victoria Park or are enjoying a Niagara Falls view from a nearby hotel or restaurant, seeing Niagara Falls bright and colourful is an absolutely stunning view. In addition to the Winter Festival of Lights, Niagara Falls New Year’s Eve fireworks shows are also spectacular to behold. 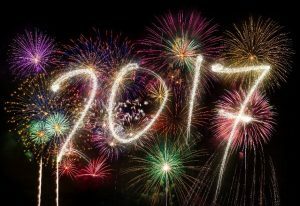 There are two fireworks shows on New Year’s Eve, at 9 p.m. and when the clock strikes midnight. 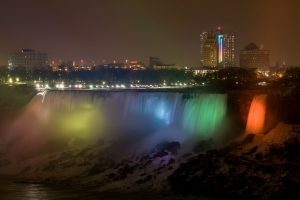 Young ones who need to get to bed early can still see a dazzling early show, and the nighttime fireworks show is talked about worldwide because of the one-of-a-kind Niagara Falls backdrop. Niagara Falls is also home to one of the most magical experiences in all of North America, thanks to local legend and International Grand Champion of Magic, Greg Frewin. This year’s New Year’s Eve bash at the Greg Frewin Theatre starts off with a cocktail reception at 6:30 p.m., That is followed by a Las Vegas-style buffet at 7:30 p.m., which includes fresh crudités, salads, seafood, herb-roasted chicken, pasta, a beef-carving station, and a dessert station to delight all palates. Greg Frewin’s world-class magic show commences at 9 p.m., and dancing at 11 p.m. with The Associates classic rock band will take you all the way into the New Year and beyond. Guests will also receive sparkling wine to toast at midnight, along with hors d’oeurves and party favours. Whether you ring in the New Year with your eyes on the waterfalls, or you take in the magic at the Greg Frewin Theatre, Niagara is the perfect place to say goodbye to 2017 and hello to 2018. Most Niagara Falls hotels have New Year’s Eve packages that provide guests relaxing stays in rooms that offer views of Niagara Falls, plus amenities ranging from dining to spa services to nightclub parties. Browse NiagaraFallsHotels.com to find a Niagara Falls New Year’s Eve 2017 package that works for your interests and budget.